What car would you recommend for the Bridal Party, Bridesmaids etc.? All the cars can carry the bride or the bridesmaids or groom etc. it really depends on what style you like and the number of people you want to carry. Here is a list of the vehicles available. These are standard seating numbers so if the bridesmaids have “big” dresses please allow for this. We have one BMW F10 which will carry up to 4 passengers. We have one BMW M5 which will carry up to 4 passengers. We have two identical Jaguar MK2s which will carry 4 passengers each. We have two identical Jaguar XFs which will carry 4 passengers each. We have two Mercedes CLS which will carry up to 3 passengers each. We have a Mercedes Limo that carries 7 passengers. We have 3 Regents which can carry 5 passengers in each car. We have a Rolls Royce 20/25 which can carry 5 passengers. Can we book which vehicles we want? Yes, provided they are not already booked. What do you provide by way of insurance? All our vehicles are fully insured for use on the road. 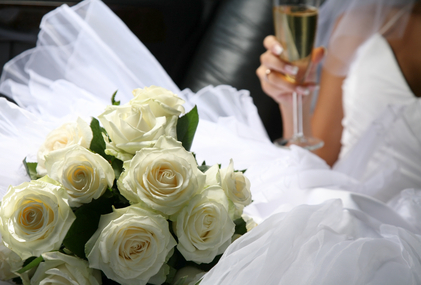 With regards to the wedding plans going awry we advise that you take out your own wedding insurance. What happens if there is a delay or the wedding goes on longer than expected? We allow some leeway, up to 15 minutes or so, beyond that we reserve the right to charge extra. Can we book on the phone? Yes, you can enquire about availability and make a provisional booking, but no booking is regarded as definite until the deposit is received. If we have to cancel the wedding or move the date, how much notice do you need for us not to be liable for the full cost? We require a minimum of three months. If we need to cancel what should we do. You should fill in the online cancellation form or email/write to us as soon as possible, including your name and the date and place of the wedding. If you do not hear back from us within a few days please ring to check we received the cancellation. Do we need to supply flowers and ribbons? No, we supply the flowers and ribbons and decorate the cars prior to our arrival. If we want champagne do we need to bring our own? No, we include champagne and glasses. That would not be known until nearer the day, but be assured all our chauffeurs are hand picked for the job, they are courteous, polite and mannerly at all times. Do the drivers wear a uniform? Our drivers wear black formal suits complete with tie and chauffeur’s cap. All our vehicles have heaters in the back compartments and are equipped with large formal white umbrellas to ensure you arrive as dry as possible. Yes, this would not be a problem. As soon as you wish, but if you leave it closer than 12 months you risk your ideal choice of car not being available. The balance needs to be paid to the to the chauffeur when he arrives, before he takes the bride to the church.